Active Trader Setups Trading Package includes our Bar Chart Trader for Alerts or link to your broker for live trading. Our Blue Diamond Reversal alerts and Key Level Marker/Alert are an important part of our trading charts. Also we have a Trend Shift Pivot that is a simple day trading and swing trading system. There are ONLY 2 Trade Setups to learn and evaluate. Trend Shift (directional change) and Retracement (pull backs). 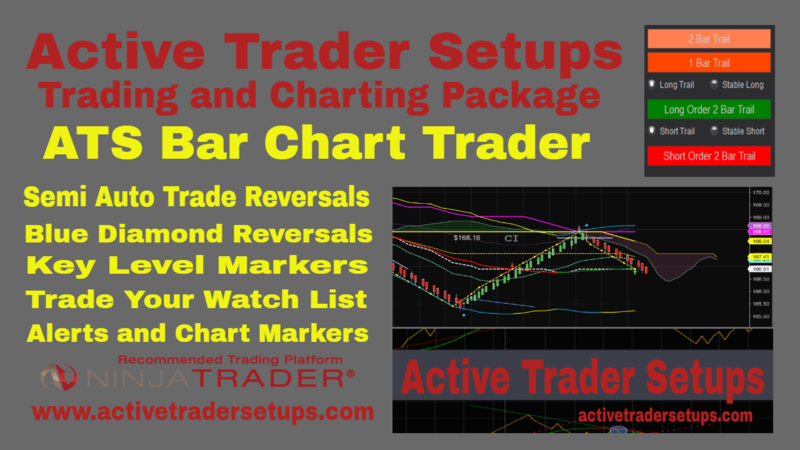 Set the Bar Chart Trader to Enter Trades on Reversal Triggers. 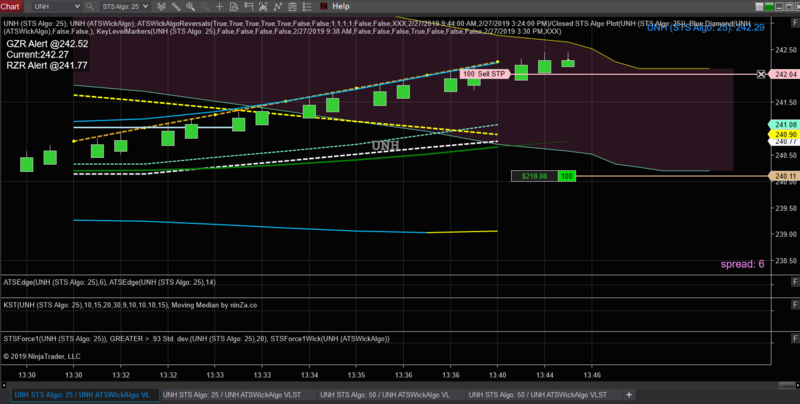 These can be live trades or traded on NinjaTrader Simulation account. The simulated trade will alert you with Position and Entry Price so you can place trades with your broker manually. The Trailing Stop will show where to have stop placed and increment higher always showing you where to advance your stop in your live brokerage account. Trade Alerts on Live Charts. Auto Trading Bar Chart Trade buttons package available to Properly Trained and Educated Clients. 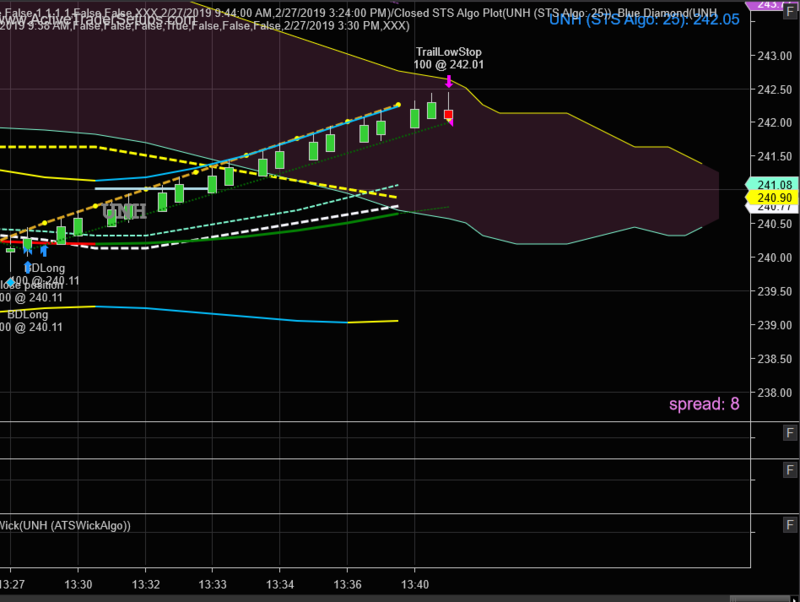 Above chart shows Auto Traded Long Entry at 240.11. Immediately a Stop Loss order is created and Trails the Price Advance on our Proprietary ATS Wick Algo Candlesticks to Maximize the Trade. Then as shown below the Trail Stop Exits the Position at the trigger price. Traders have 2 options on the Trailing Stop to allow a little more room on more volatile stocks. The Bar Chart Trader buttons can be customized by you the client in the settings for how many bars back to Trail the Reversal Order and clients can create custom names for each button as well. The trailing stops are also customizable and a Profit Target is optional and can be set to user preferences. Traders have the option to Trade Long and Short, Long Only, or Short Only. Giving traders the ability to assess the Trend and enter only trades in the direction of their choice. If you are trading your own IRA you can select Long Only. You can use the NinjaTrader platform at no charge if you are not auto trading. Use our Bar Chart Trader to enter simulated positions. First as your Trailing Long order is on the chart the Long Entry Price is plotted right on the chart and when a Position is entered the platform will give you the alerted fill price and then place the trail stop price on the chart for you to follow in your live brokerage account. * A fully License NinjaTrader Platform is required for AutoTrading. 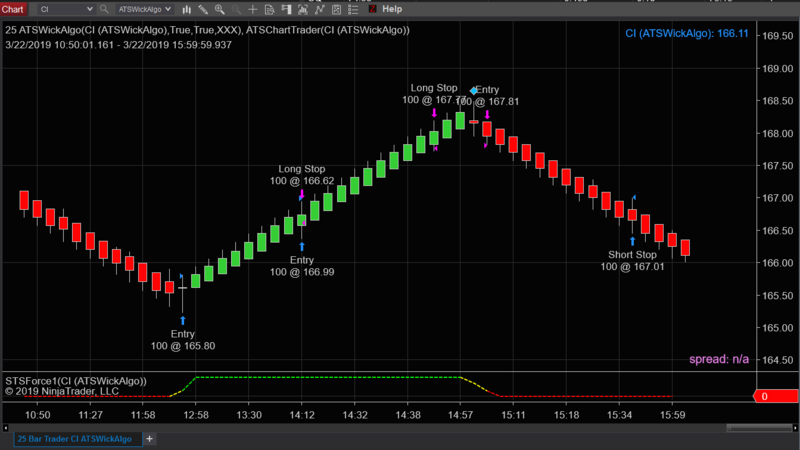 All Alert Packages can be ran on NinjaTrader8 Platform without a License NinjaTrader product.